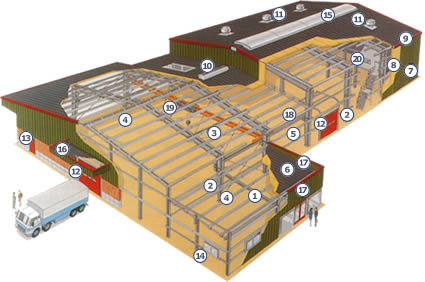 Designing and Constructing steel framed buildings in South East England since 1988. At Directline Structures, we specialise in steel framed buildings, mostly in Kent and the South East, but also around the UK. We have the knowledge and experience to design and build your project on time and on budget. Every project is different and we will use whichever construction method is appropriate, but in many cases a steel frame can improve functionality, broaden possibilities and reduce construction and maintenance costs. We have worked with Astron Building Systems since the very beginning of Directline Structures and have built up a strong working relationship. We are proud to be an Astron Building Systems Approved Dealer, and are one of the most experienced in the country. Astron is a Luxembourg based company which designs, fabricates and transports the steel frame elements of the buildings. Our in house Architect prepares outline designs and works closely with the engineers at Astron Building Systems to optimise the structure and design of the building from very early stages. Find out more about Astron here. Large spans allow you to create rooms and spaces without interior columns. The strength of steel allows for impressive engineering, canopies and overhangs. Steel with high yield strength reduces weight, thus optimising the transportation and handling costs whilst meeting all design criteria requirements. Many European technical approvals and certificates including CSTB (F), EMI (H), TZUS (CZ), ITB (PL),. . .